Food aid donated to drought-hit Eritrea may be rotting in warehouses, diplomats and aid officials have warned. President Isaias Afewerki insists Eritrea is self-reliant. He has put restrictions on handouts and last month expelled at least three aid agencies. Last September, the number of people receiving free food was cut by 94% to 72,000 out of a population of 3.6m. After a bad harvest, it was estimated in 2005 that at least one in three Eritreans needed food aid. Some 11m people are in urgent need of help in the region after late rains affected most of East Africa. "Donors are concerned about the food sent since 2005, which is still in government warehouses, with the obvious risk of deterioration. We don't want to see 100,000 tonnes of food aid rot," one aid official said. The UN special humanitarian envoy for the Horn of Africa is visiting Eritrea next week. Kjell Magne Bondevik is expected to raise the international community's concerns when he meets officials in the capital, Asmara. 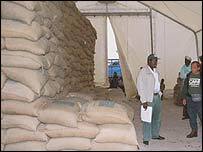 President Afewerki has accused the UN of lying about Eritrea's food situation. The country has gradually reduced its relations with the world community. Last year, Eritrea turned down a crop assessment mission from the UN's agencies. The BBC's Ed Harris in the capital, Asmara, says anecdotal reports say some people are already moving around or out of the country in search of food, and some hospitals are struggling to cope with malnutrition.